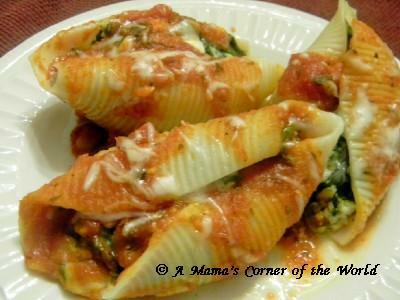 Spinach stuffed shells are probably my favorite non-lasagna Italian dish. If I tread lightly with the amount of spinach--I can even convince all three girls to eat them as well! I have also been known to turn this into a (quicker and easier) lasagna dish by adding the veggie filling to a large jar of pasta sauce and alternating lasagna noodles, veggie sauce, and the cheese mixture as in a usual lasagna. Want to try spinach stuffed shells--but, have a non-spinach lover in the house? Sometimes I will separate a bit of the cheese portion of the filling and fill a few servings of the shells with only the cheese and none of the veggie mixture--I top them and bake them right along with the other shells and I am able to please everyone from one pasta pan. Instructions for Making Spinach Stuffed Pasta Shells. Saute the Vegetables. Heat butter and olive oil in large saute pan until hot. Add the onions and cook for approximately 3 minutes. Add the mushrooms and cook for another 2-3 minutes or until the onions are translucent. Add the garlic and cook for an additional minute. Mix in the spinach and thoroughly break apart any clumps of spinach as you mix it with the other vegetables. Sprinkle in the salt, pepper and italian seasoning. Combine the cheeses. In a blender or food processor, combine the cottage cheese, the parmesan cheese, the mozzarella cheese and the egg. Pulse until the mixture is nearly smooth. Create the filling. Combine the vegetables and cheese mixutre in a large mixing bowl or in the blender if desired--being sure to thoroughly incorporate the vegetables. Prepare the baking dish and the oven. Preheat oven to 350 and lightly spray a baking dish with nonstick cooking spray. Spoon 1/4 c. pasta sauce over the bottom of the baking dish and spread it out evenly. Fill the spinach stuffed shells. With a large tablespoon, add 1-2 heaping tablespoons of filling into each shell.Place the filled shells into the baking dish with the opening facing upward or tilted slightly the the side. Top the filled pasta shells and bake. Pour the remaining sauce evenly over the top of the filled spinach stuffed shells. Sprinkle reserved mozzarella over the top. Cover and bake for 30 minutes. We almost always serve with garlic breadsticks and salad. OMG this looks DELICIOUS!!! I have to try this very soon, and I'm usually the bad cook in the family. My husband teases me about it all the time lol! I'm Lynn from Scrapity Anne and I found you through 7 Kids and Counting's blog hop. I've followed you and hope that you can do the same for me. Have an awesome weekend! Those stuffed pasta shells look great. I am not a big fan of spinach but it would not hurt me to try such a delicious looking dish.